Large corporations, multi national companies especially the ones that hire a few thousand to many a thousand employees year on year are in a quagmire. Many of the few thousand jobs that they were creating (which in turn fueled their growth) are being replaced by AI, M2M and other disruptive innovations. At the same time these disruptive innovations has opened up opportunities. The winner in this new scenario will be the companies that adopt to these realities. The thousands of talent working in these large multi national offices also are feeling the effects of the changes that are impacting work. Many of them have now got to learn new skill sets to be relevant in the industry. The skills that had previously made them indispensable or relevant are now being automated. Even previously thought of work that was needed reasoning and always belonged to humans have now being taken over by AI. There is a clamor in the industry on renovating their office spaces to meet their challenges that the new reality brings. I have received a few calls from real estate heads/ project managers/ facility managers trying to make sense of all of this. ‘What does Agile mean to a workplace?’ is the most common question that I get. So how does this affect the office space? Todays work flow isn’t linear and its not even a predictable one. It is a combination of different activities and requires both divergent and convergent thinking. Hence the workplace and the work tools have to cater to this dynamic work process. Here are some of the options that should be considered while working on the workplace. Every day could mean a different work style. One day could be with teams that require intense interaction, some days may require focused work. Work may shift from group to group. Hence one should have the flexibility to be able to identify where groups are positioned within the office at the same time be able to book his/her place in the office through the use of technologies like booking Kiosks or booking apps. 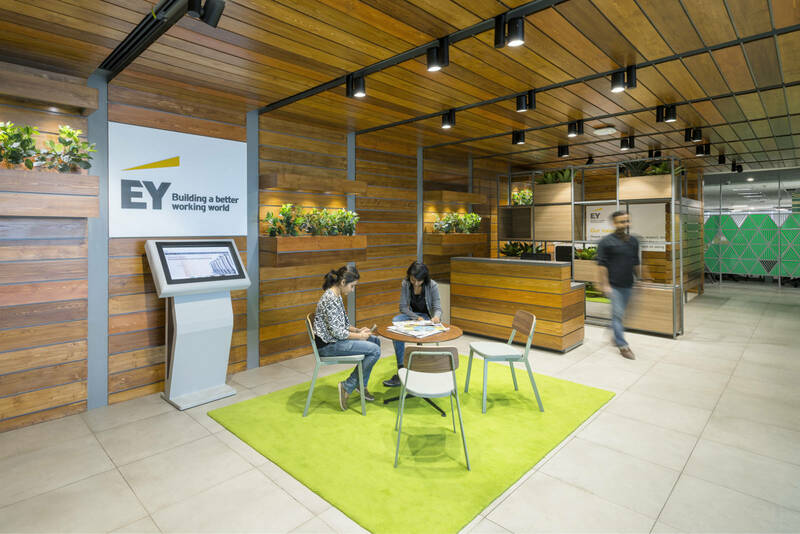 A tech enabled destination around the office that encourages active participation and equal opportunity to contribute as people co-create, refine, debate and share ideas with teammates around or with teammates across geographies. At times one needs to get away from the buzz, the distractions, the collaborative settings for some solitude and individual think time. Having a mix of these rooms across the floors which are easily accessible and easily bookable. Tech enabled rooms that encourages active participation and allows multiple teams working on a project to come together and co-create , refine, share ideas and debate to enable decisions to be taken on the fly and products and projects to come alive faster than previously before. Work requires many brain states as it is not always a linear process. Having a mix of these pods across the floors which are easily accessible is desirable. These are an everyday base station for co-creators. Even here a basket of desking options blends itself to serious work, collaboration and team work. These would make up most of the office. Every office now needs to have spaces wherein co-creators have the ability to move away from their base station and be able to collaborate on the fly, where each group can control the amount of privacy that they need by using movable acoustic panels and writing boards on wheels. ‘Sitting is the new smoking’ means that co-creators need the flexibility to stand and work.. Hence the need of height adjustable work desks. It does sound a little weird to have treadmill workstations, but there are really great to work on. The treadmill is set on a lazy speed and after a while you get into the zone.